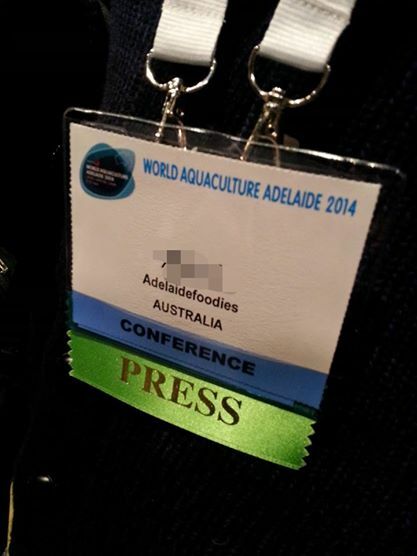 World Aquaculture Conference 2014 (WAA 2014) was held in Adelaide Convention Centre from June 7 until 11. This was the first time South Australia held this conference and was the biggest event the state ever held. 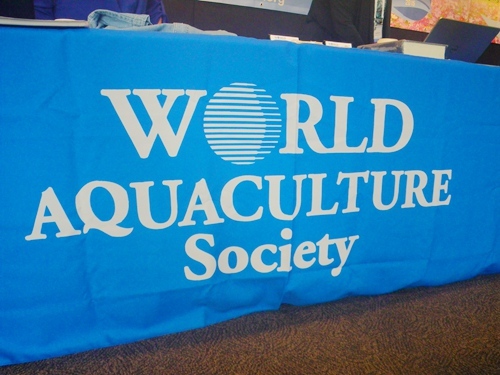 Hosted by the World Aquaculture Society and sponsored by PIRSA, the conference has attracted approximately 3000 delegated from all over the world from aquaculture seafood sector to Adelaide and an estimate of $11.5 million has been injected into our state’s economy. Adelaidefoodies.com was chosen to be involved in this conference with live tweeting the contents. This was also the first time, to my best knowledge, that social media was classified as press along with traditional media. Those of you who follow me closely on twitter probably have seen a lot of pictures during the conference and heard me tweeting about stories behind each talk. 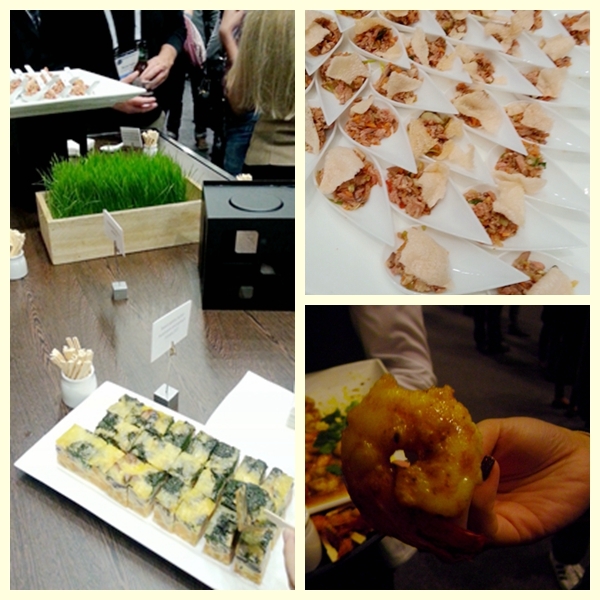 Now, this post will show you more about my adventures and experience during the conference. Although WAA2014 did not start officially until June 7th, there has been two associated workshops for higher education students to discuss and present their works. Hence, on the night of June 5, a dinner named AquaEd was held in Adelaide’s Public restaurant on Franklin street. At the dinner, Tina and I met interesting people from the education sector of the aquaculture industry. The dinner menu focused on seafood as the main theme with local produce as well as one meat dish for both the entree and main courses. 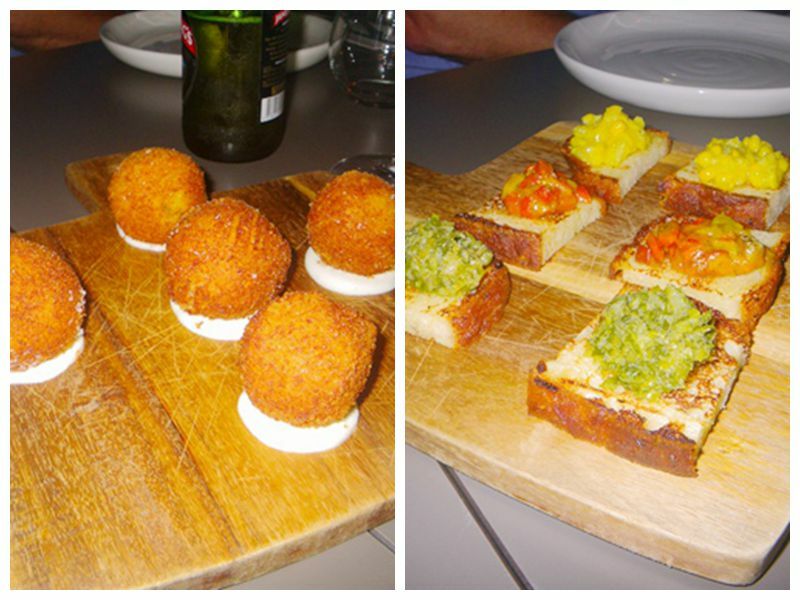 The highlight of the night was the two entrees, the king prawn katafi and the roasted quail breast, both of which exhibited high level of tenderness and original flavours of the produce. 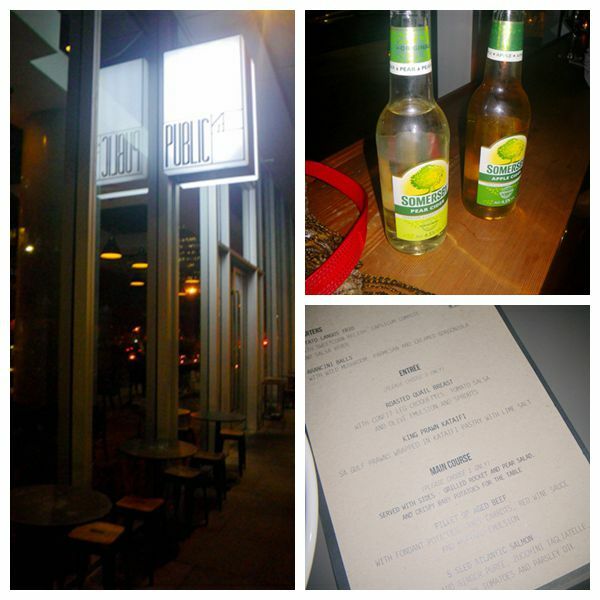 Public has been around for a couple of years on Franklin street and has gained reputation in food and drinks since opening. We came across two school teachers from Mt Gambier as they introduced to their students an aquaculture related project to raise fish in the school. They came to learn more from the academics :). With all these enthusiastic people, Australia’s aquaculture sector is definitely leading the industry worldwide. 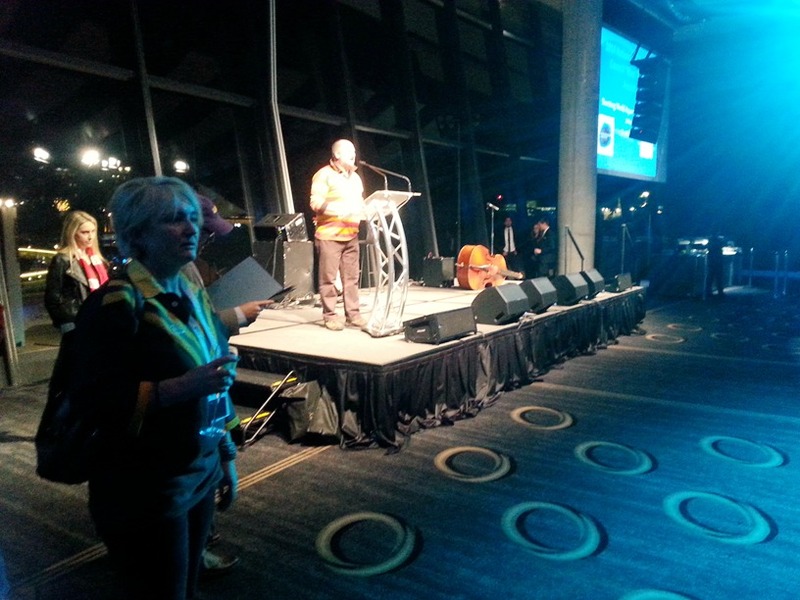 The night after the AuqaEd dinner marked off the official start of WAA 2014 in Adelaide Convention Centre. 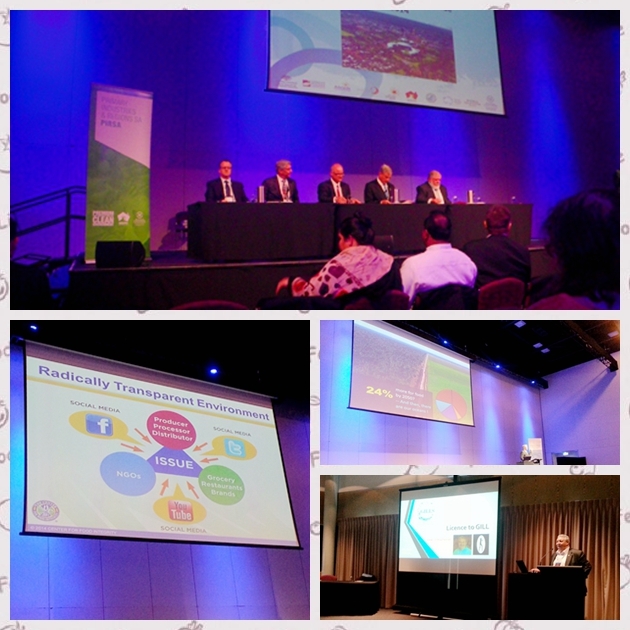 Being held the second time in Australia and the first time in South Australia as mentioned previously, the conference attracted attentions from both within the industry and local and international media. Photographers from The Advertiser and other local media were on site throughout the night. According to the Chair of the conference, Roy Palmer, the conference in Adelaide was also the first time to recognise social media as press and was a trial for this new media channel. Aquaculture industry has become one of the most important source for seafood to feed the world with controlled growth method and hence it was a great opportunity to introduce local South Australian culture to the multi-national delegates. 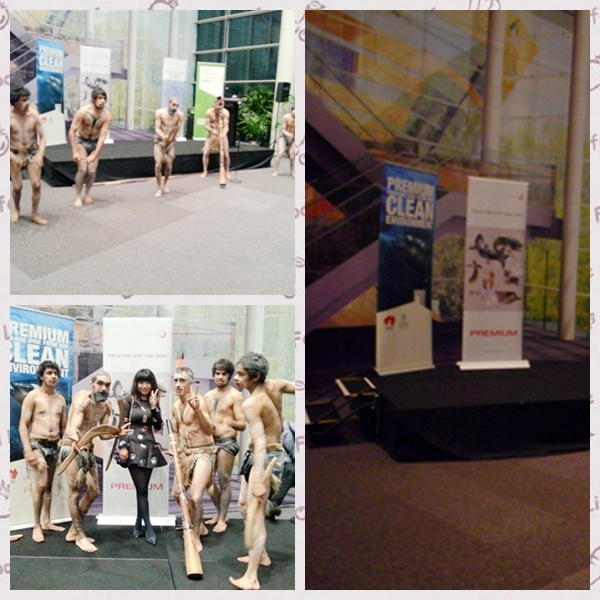 The conference committee did a great job for organising an aboriginal dance to show our respect to the people. It also provided the delegates with an idea of what Australia’s multiculturalism is really about. People from Asia, Europe and other continents were all very keen to take photos with the performers to express their interests in our culture and value. 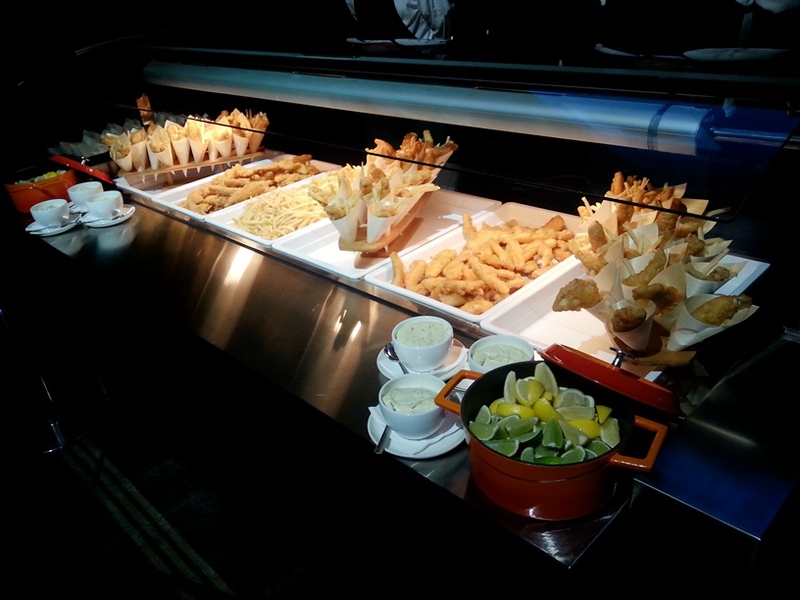 All delegates and attendees at the opening night were provided with cold and hot food with strong local aquaculture seafood focus. Adelaide Convention Center’s kitchen must be super busy during the night to serve these many diners. Cold dishes included tarts, Asian styled rice and salmon with sesame seeds while hot dishes featured curry prawns and sweet and sour chicken. 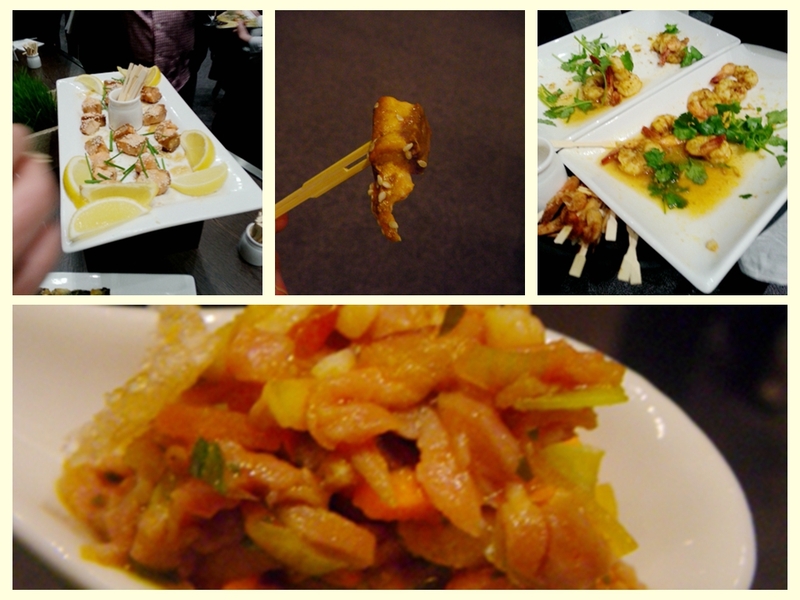 I should admit that they did a brilliant job as the food was of high quality. 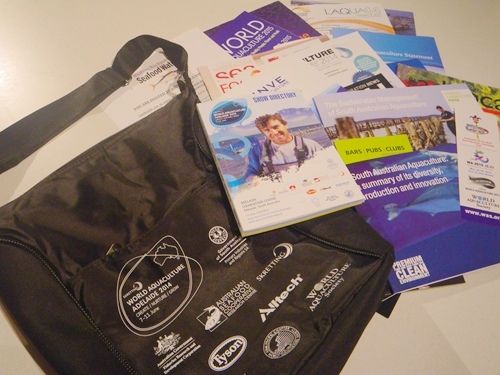 All delegates of the conference were also provided with an information pack, including essential information for them to get around in Adelaide as well as other professional brochures in the field on the South Australian aquaculture industry. 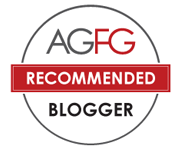 Since the nature of the conference was much research based and I don’t work in the industry, I picked three seminars that were relevant to South Australian seafood and/or social media to attend. The first and second seminar focused on the social license of the aquaculture industry. It was indicated that social media nowadays play an important role in the aquaculture industry. Research in the United States has shown a direct correlation between correct social media strategy and the increase in sales as well as the increase of social awareness in consuming aquaculture seafood, especially with a prediction of future shortage in food in both seafood, meat and other agricultural food. Another seminar that I attended was on oysters and related technologies and sciences associated with the growth of oysters. 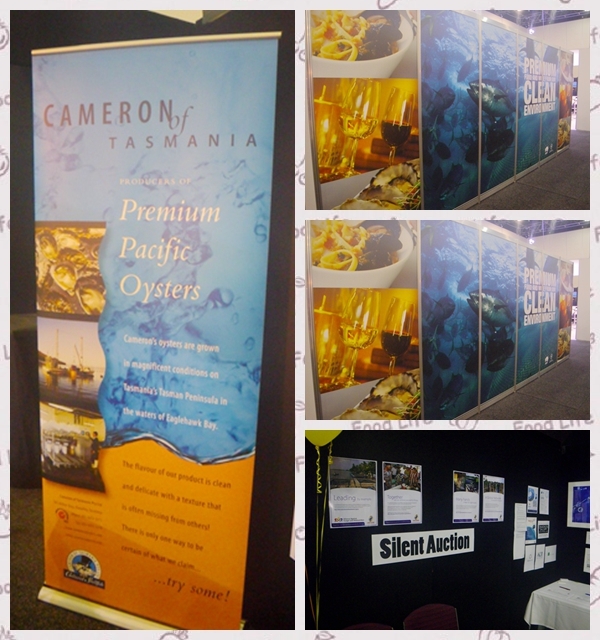 It was interesting to know what has happened to the oyster sector in Australia and how scientists and government agencies cooperated together to overcome the problem. This is also a good example to showcase the effectiveness of aquaculture in providing safe and clean seafood. Although the seminars may be a bit dry, there was also a interesting trade show at the conference. At the show, I spotted several interesting stuffs as well as some tasty local produce that I’ve never seen in the market before. 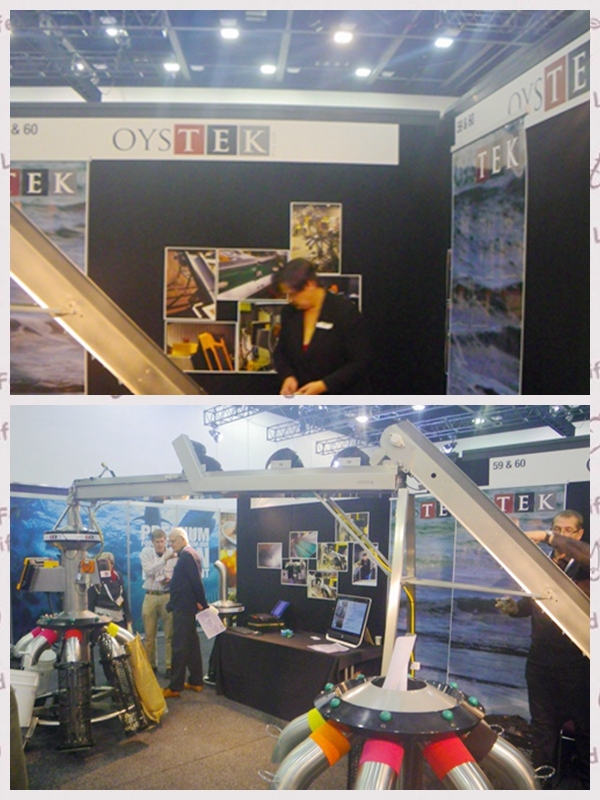 At the show, it was my first time to see how oysters were picked according to their sizes using machines. Prior to the conference, I thought farmers needed to pick oysters by hand but never thought this could be done automatically. 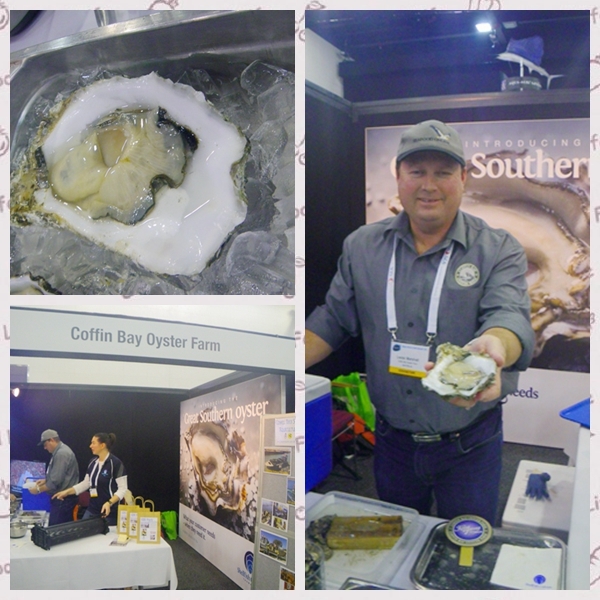 There was also a local oyster producer from Coffin Bay. Do you know Port Lincoln Hotel serve a 1 Kg weight oyster for $100? This is the one shown in the picture below. The oyster was huge with approximately a size of a hand. Another interesting local aquaculture producer was Robarra. Do you know there is a barramundi grower in West Beach? I didn’t know until I met with their Managing Director. The fish was grown in ancient spring of Australia and was regarded as the only one of its type that can be consumed as sashimi. 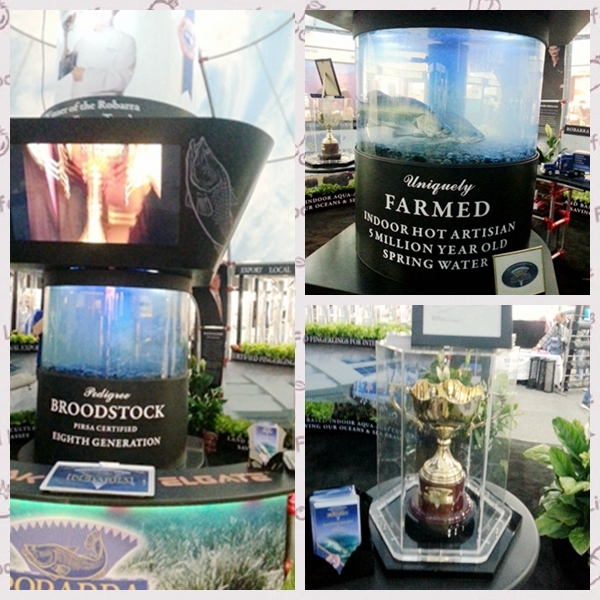 Robarra has been in business for a long time and barramundi has won numerous amount of awards. 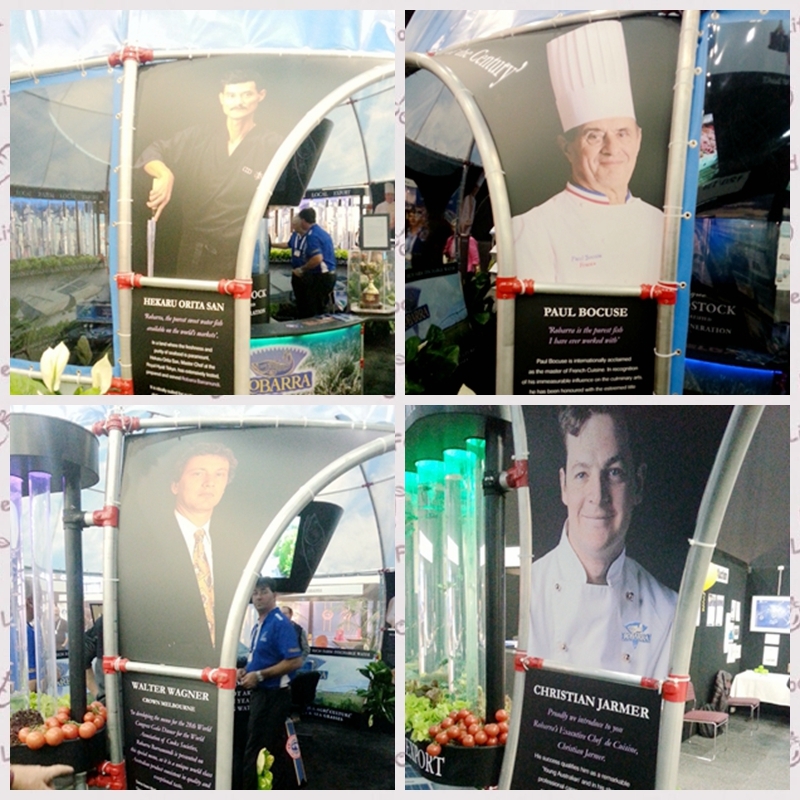 The fish is used in top restaurant worldwide and has been endorsed by many of the world’s finest chefs. 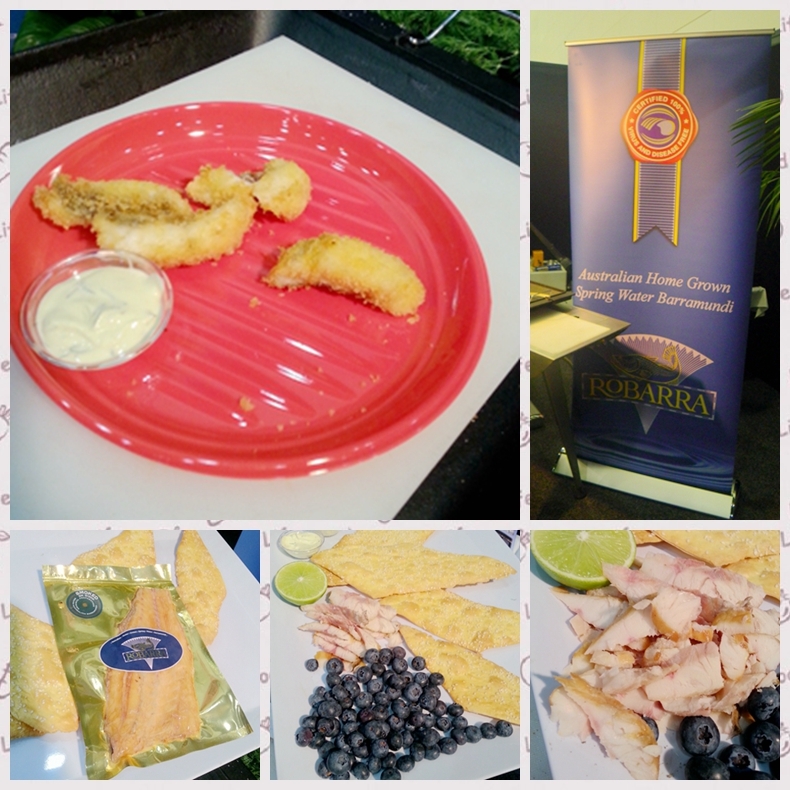 While at the trade show, I tasted their fish. OMG, it was beautiful! The flesh after deep frying was still very tender and moist with heaps of flavours. Being clean on the palate, the fish also maintained the right level of omega 3 oil and fat which made it melt in the mouth easily. Their smoked barra also caught my attention with the flavoursome pinkish barra flesh and blueberry. The President’s Reception concluded the WAA 2014 at Adelaide Oval. At the dinner, a number of awards were presented to winners both in research and education as well as in the innovation of aquaculture technologies. The dinner also featured lots of Australian delicacies such as smoky bay oysters, crystal bay prawns (very sweet), fresh salmon and kingfish sashimi as well as hot fish and chips. The reception party was fun filled. 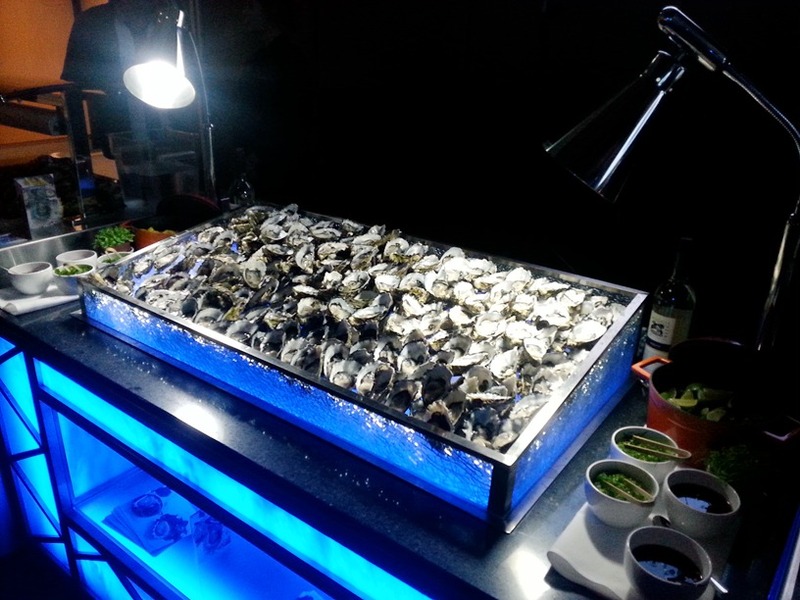 Many people were provided a live oyster to taste. Attendees were also required to wear their national dress or the sporty shirts for their supporting team. I also met several local producers, retailers and chef Dennis Leslie. 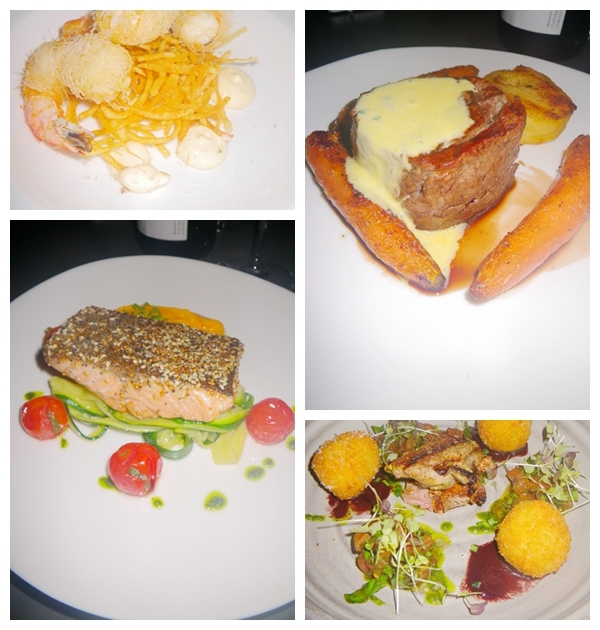 It was an extraordinary dinner with high quality of food. 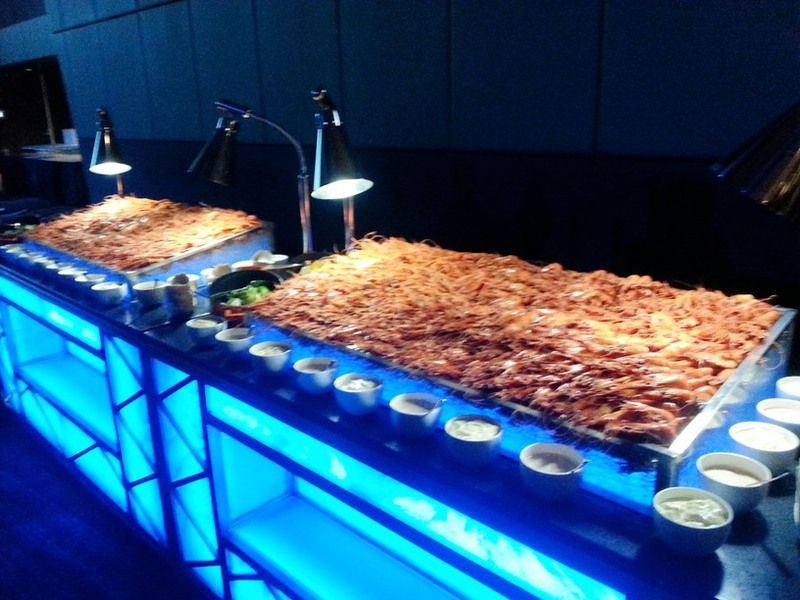 The team at Adelaide Oval did very well in holding a large function like this. Overall, the WAA 2014 was a total success with so many attendees and delegates from all over the world. I came across people from the US, South Korea, Japan, China, South Africa and many other nations. 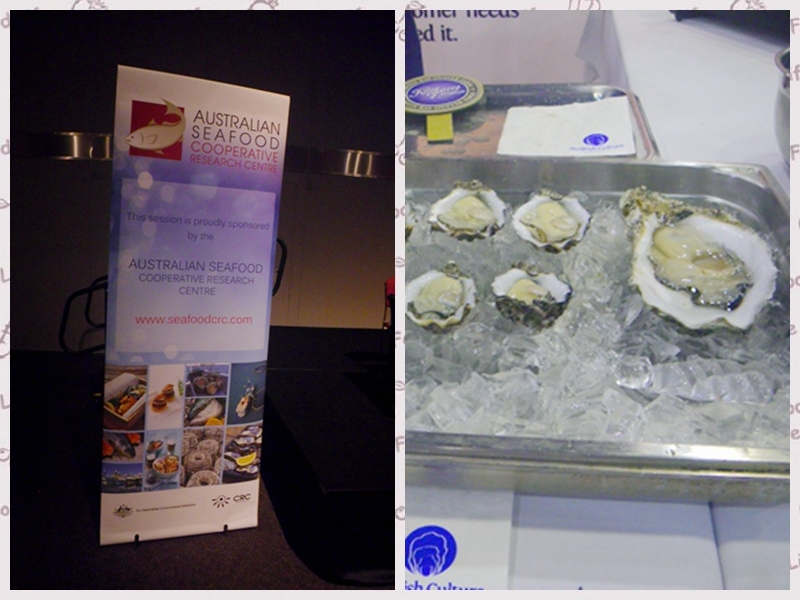 It did not only provide an opportunity for the people in the field to exchange their ideas and research but also let them learn about Australian and South Australian aquaculture produce and culture. 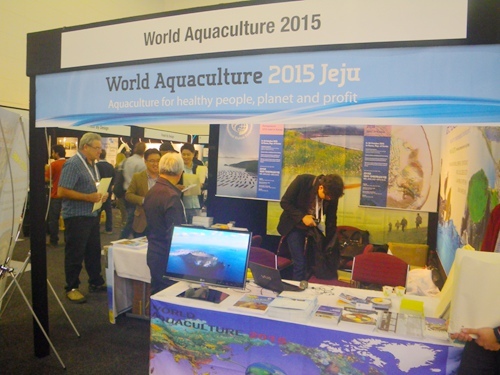 The World Aquaculture Conference 2015 will be held in Jeju Island, South Korea. It’s great to see you back. I was waiting to read your final experience at the conference last month and thought you disappeared. I have been quite busy with marking but should have a good week of break now. These research conferences should at least have one session for the public so we can all experience how research changes our lives. What a feast! 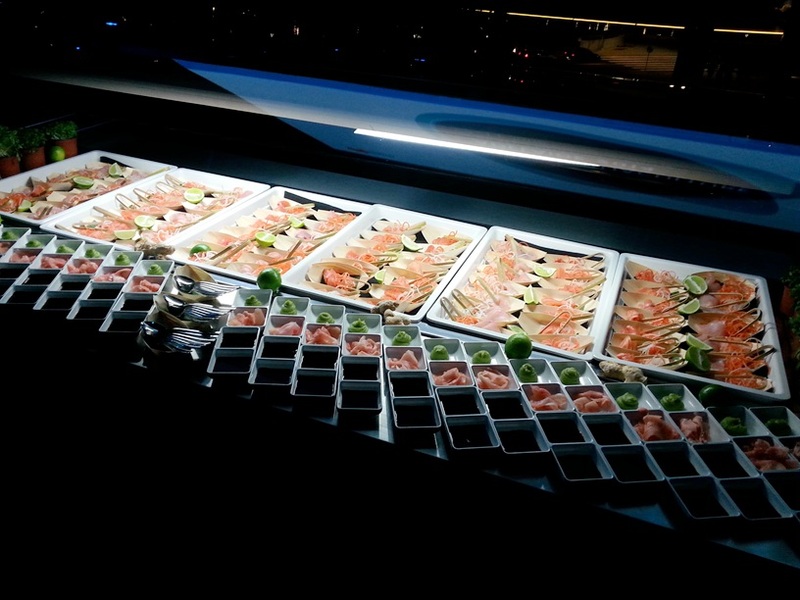 I’ve craved ome good sashimi grade seafood for a long time. Unfortunately, we are in ADELAIDE. I know. In Sydney fish market, there are heaps for sashimi grade fish. If you go around the central market, there are some good ones too.